"I bought a rice cooker and wanted to use it for more than just rice. 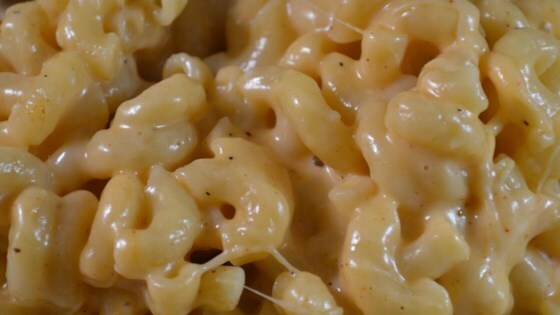 I've made this mac 'n cheese several times and it always comes out delicious! If you like your mac 'n cheese nice and crusty, leave the pot on warm for another 10 to 15 minutes after stirring the cheeses into the cooked macaroni." Mix macaroni, broth, and almond milk together in the rice cooker and cook according to manufacturer's instructions until macaroni is tender yet firm to the bite, 30 to 40 minutes. Stir Cheddar cheese, mozzarella cheese, Parmesan cheese, paprika, salt, and pepper into macaroni mixture until cheeses are melted. Great taste and classic goodness prepared in a slow cooker. I make this in my small Aroma® 2- to 8-cup rice cooker. If you have a larger unit, you may easily double or triple this recipe. Elbow macaroni works best in this, but you can use rotini, penne, shells, or whatever smaller pasta you have on hand. Barilla Plus® pasta is tasty and makes the dish extra nutritious. I used low-sodium chicken broth, but any kind would be good. Any type of milk can be used in place of almond milk. Red pepper flakes can be used in place of paprika. I like my macaroni and cheese with a little more "spice" to it, so I added dried mustard. pepper, garlic and onion flakes. They add an even nicer taste.